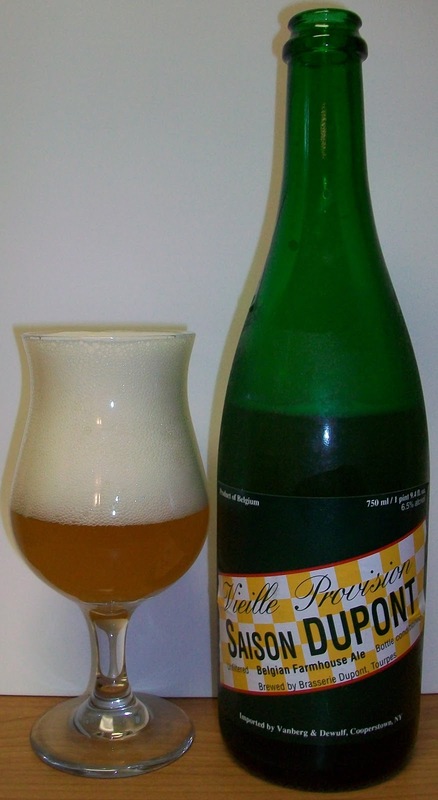 Saison Dupont is a classic Belgian farmhouse ale. This is a beautifully balanced, complex beer that has a refreshing fruitiness and long, dry finish. It is bottled unfiltered so it may be cloudy or have a slight sediment but this is normal and perfectly natural. This beer is my gold standard for this style. Since I added this to my Second Annual Craft Beer Event I figured I should give it a full review. I’m not expecting any surprises but it will be interesting to give it a full review. The bier pours a hazy golden yellow with a fairly rich bright white head. Ahh, the nose is to die for. Well that is if you like Belgian Funk. The nose is full with earthy aromas that you can only describe as funk. It is the earthiest aroma, and I mean earthy like farm dirt, earthy. There are also pale malts, floral hop and citrus notes on the nose. Ahhhhh, Saisons just don’t get any better than this. This is a very unique taste with those earthy notes on the nose are exactly how they taste. This is also a unique style that does not start out with sweet malts up front. Almost from the first sensory experience there is that funky earthy flavor. This earthiness builds throughout the middle of the sip. There is also a very nice effervesce over the tongue in mid-sip. The back end is very easy drinking with more carbonation release during the swallow. The finish is where it all comes together. The finish has a nice hop bitterness along with this funky yeastiness. I’m not sure bitterness is the right word this bitterness is nothing like an American IPA bitterness. But this bitterness is from the Belgian hops. The final aftertaste is a lingering yeasty earthy funk. This is still, hands down my favorite Belgian Saison. I consider this the gold standard for Saisons. Even as this warms a little it remains very refreshing. Of course you have to like that Belgian Funk, and I love it. I purposely used a tulip glass for this review even though it is not the traditional glass for a saison. I knew that this bier produced a rich head. So I took advantage of the tulip design to capture that head and in turn add creaminess to the mouthfeel to this experience. Sorry if I lost you on that but it really did work. With each sip I also consumed some of this reach head. And that rich head adds to the mouthfeel of the bier. With the diminishing head this only works for a few sips after each pour. This is a solid A+. This bier is my “Gold Standard” for this style. It is a very refreshing, flavorful and down right Funky Saison. The earthy flavors and spicy notes mentally put me on an old Belgian Farm consuming one of these refreshing beers after a hard day’s work. The funky notes are not for everyone but I Love That Funk!